The view from the deck of Blue on Plum Island. NEWBURY — Lark Hotels has picked a plum spot for Blue, their newest hotel. 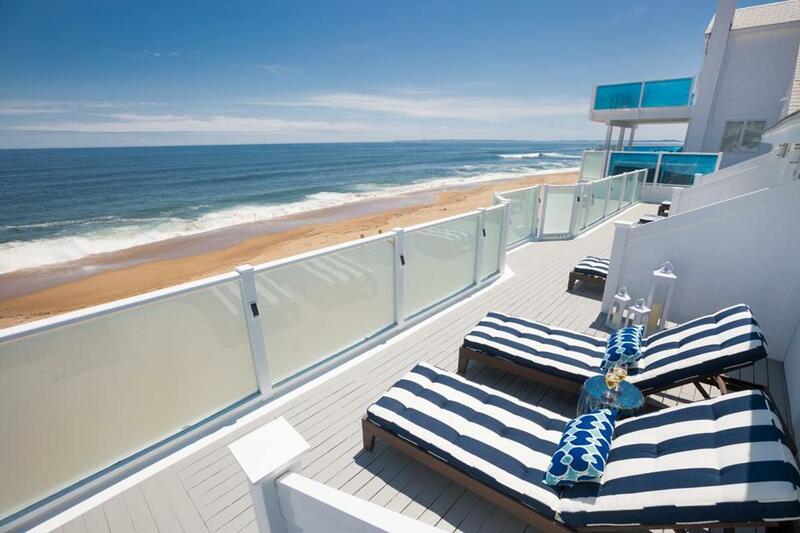 The year-round, 13-room boutique inn opened June 22 on Plum Island, the darling of Massachusetts North Shore. 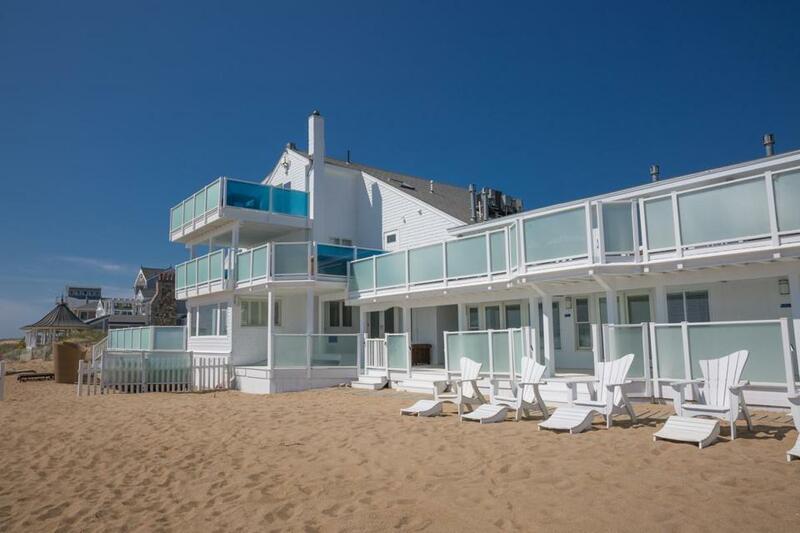 Lark Hotels bought the property — which was previously named Blue, the Inn on the Beach — from New York businessman Julian Geiger. It is the island’s only hotel and is surrounded by million-dollar oceanfront homes and beach cottages. Shades of blue are splashed prominently throughout the stark white, whimsically-furnished hotel — including cobalt blue glass pebble paths and walkways that snake throughout the property, and blue-and-white striped chaise lounges strategically placed to have great views of the Atlantic. While the beach that the hotel fronts is public, some guest rooms have sandy areas directly outside with beach chairs for guests’ exclusive use. 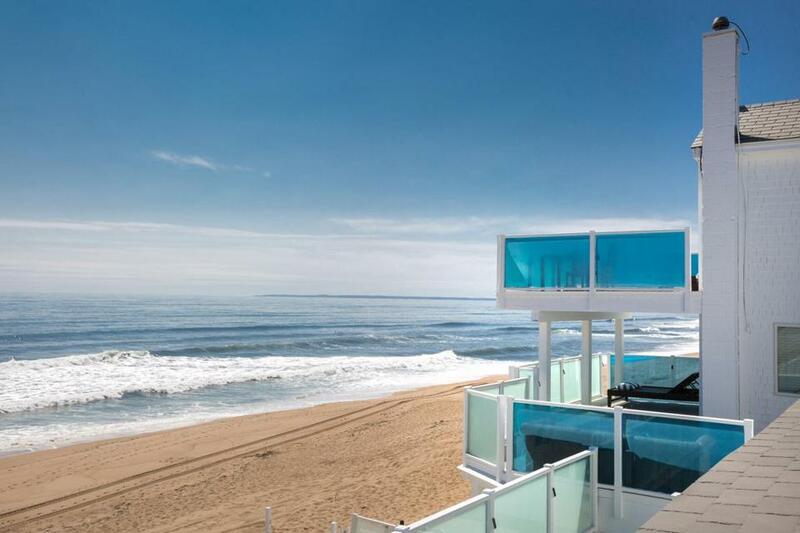 The oceanfront Blue Suite, a 2,200-square-foot space, has direct access to the beach and a wood fireplace, and the ocean-view Lark Suite features expansive wrap-around windows. Beach cottages have lounging decks (the cottages are across a narrow street from the beach), and some have wood fireplaces. The Blue hotel on Plum Island. Guest rooms are outfitted with iPads, Apple TVs, Tivoli Bluetooth radios, in-room refrigerators, wine glasses, and bath amenities from Lather. An outdoor gathering area features designer Adirondack chairs, fire pits, and hot tubs. Complimentary breakfast baskets (house made breads, muffins, and scones, juices, yogurt, overnight oats, and baked eggs) are delivered each morning to guest rooms, which also have Keurig coffee makers. And bicycles are also available to guests to explore the island and wildlife refuge. What you won’t find is a blue plate special at Blue, because there isn’t an on-site restaurant or lounge. But several restaurants are an easy-breezy walk from the hotel, including Plum Island Beachcoma for burgers and a Red Sox game (www.pibeachcoma.com), Mad Martha’s Café for breakfast and lunch (www.madmarthasislandcafe.com), and Plum Island Grille for the sunset, cocktails and dinner, (www.plumislandgrille.com). There are also many places to go within a 10 minute drive, including The Poynt (www.poyntnewburyport.com) and The Black Cow (www.blackcowrestaurants.com) in Newburyport, and The Deck, just over the bridge in Salisbury (www.thedecksalisbury.com). Double room rates range from $239 to $1,139 per night, depending on the accommodations and the season. www.blueinn.com. A view from the Blue hotel on Plum Island.